To be honest: I only have few information on this crane. The Falcon-80M (Сокол = Falcon) is a heavy Russian crane with a lifting capacity of 80t on a two stages telescopic boom. 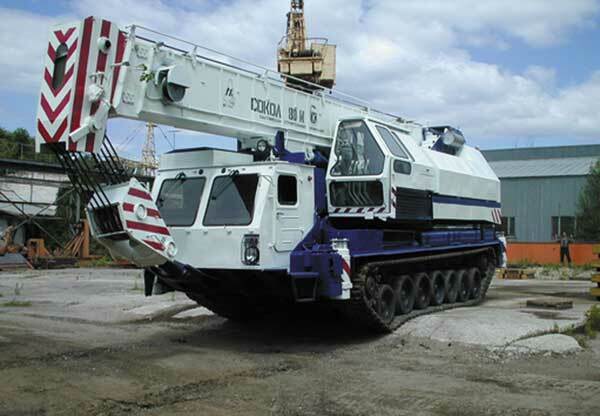 Two variant exists, the first one is Falcon 80.01 and is mounted on a wagon for railway crash salvage and recovery, the second one is Falcon 80M which is mounted on a self-propelled tracked vehicle equipped with outriggers, able so to be also used in hard off-road environment . It is this version that kept my attention. For a Lego building of this crane, I hesitate between to option. Regarding the scale of the vehicle… well, no idea. The crane part will lead the project so the carrier will be built on its scale. Note: I don’t mind if you like this idea and build it before I do. But do not hesitate to quote me as source.